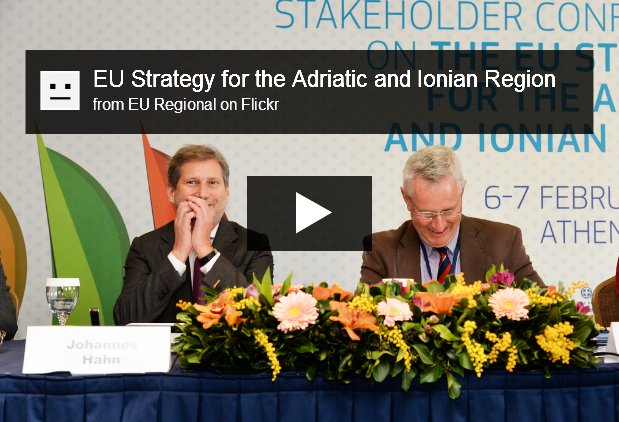 A Stakeholder Conference on the EU Strategy for the Adriatic and Ionian Region, jointly organised by the European Commission and the Hellenic Presidency of the Council of the European Union, will take place at the Divani Caravel Hotel in Athens, Greece, on 6-7 February 2014. Building on the experience gained in the macro-regional strategies for the Baltic Sea Region and the Danube Region, and following a request from the European Council, the European Commission and the participating countries are is now proceeding to draw up an EU Strategy for the Adriatic and Ionian Region. The new Strategy will integrate the Maritime Strategy for the Adriatic and Ionian Seas, adopted by the Commission on 30 November 2012. The EU Strategy for the Adriatic and Ionian Region (as the Maritime Strategy) will cover eight countries: four EU Member States (Croatia, Greece, Italy, Slovenia) and four non-EU countries (Albania, Bosnia and Herzegovina, Montenegro, Serbia). It focuses on areas of regional mutual interest; these are based around four main "pillars": 1) "Driving innovative maritime and marine growth", 2) "Connecting the Region", 3) "Preserving, protecting, and improving the quality of the environment", and 4) "Increasing regional attractiveness'. During the Conference, the results of the extensive consultation with stakeholders taking place from September to December 2013, alongside with a public consultation launched by DG REGIO will be presented. The Conference will promote a debate with the participants on the future challenges that can be tackled following a macro-regional approach. This will support the preparation of the future Communication and Action Plan of the Strategy, which the Commission is due to present before the end of 2014. Workshop 1: "Driving innovative maritime and marine growth"
Workshop 2: "Connecting the region"
Workshop 3: "Preserving, protecting and improving the quality of the environment"
Workshop 4: "Increasing regional attractiveness"